The Japanese Navy in April 1944 opened a branch of the Otake Submarine School in Hirao Town on Atata Peninsula in Yamaguchi Prefecture. In March 1945, the Navy established a kaiten human torpedo training base at the same location in Hirao. In November 1992, the Hirao Museum of History and Folklore opened up a kaiten exhibition room. These kaiten exhibits were moved in November 2004 to the newly constructed Atata Exchange Center located on Atata Peninsula. The Exchange Center now displays over 300 items with about three quarters of them related to kaiten or World War II. A full-size kaiten replica used in the 2006 movie Deguchi no nai umi (Sea without exit) is exhibited in front of the building. 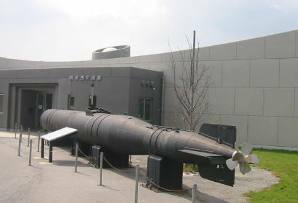 The sign in front of the replica explains that the kaiten was a sure-death weapon in that the large-size torpedo filled with 1.55 tons of explosives at its tip was steered by one pilot, who crashed it into an enemy ship. At the left-side of the building entrance, a monument erected in 2004 remembers the families who had their homes forcibly taken by the Japanese Navy in order to construct the Yanai Branch School (sometimes referred to as Hirao Branch School) of the Otake Submarine School. The highlights of Atata Exchange Center include photos of the nine Hirao kaiten pilots who died, a 1/10 scale kaiten model under the photos, kaiten pilot writings, and a model of the base. A map above the base model shows that kaiten training took part on the base's southern side, while Koryu and Kairyu midget submarine training took place on the northern side. The museum has a wide variety of other kaiten-related exhibits including historical photos, uniforms, periscope, stopwatch, senninbari (thousand-stitch belt worn for good luck), photos and information about the other three kaiten bases, and smaller kaiten models. One interesting photo exhibit shows the 1959 unveiling ceremony of the nearby Hirao Kaiten Monument. 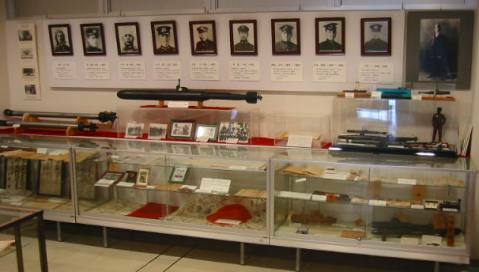 General WWII-related exhibits include medals, caps, and various models including ones of other suicide weapons such as midget submarines and ohka rocket-powered gliders. The nine young men from Hirao Kaiten Base who died include five kaiten pilots who left Hirao on July 18, 1945, aboard Submarine I-58. East of the Philippines on July 28, two of I-58's six kaiten were launched. Shortly after midnight on July 30, I-18 launched two torpedoes that sank the cruiser Indianapolis (CA-35), and nearly 900 of her crew died in the attack and afterward in the water. Three more I-58 kaiten were launched as the submarine returned to Japan. In addition to the five I-58 kaiten pilots who died in battle, three men died during training at Hirao, and one man took his own life on August 18, 1945, after the war had ended. Atata Exchange Center has about 100 books related to kaiten and other special attack weapons that are available for perusal during a visit. Also available for reading are copies of numerous pages of actual Hirao Base kaiten training records. Admission is free to Atata Exchange Center. Exhibits do not have any English explanations. A four-page pamphlet in English is available, but the translations from Japanese are quite rough in places. The Hirao Town Tourism Association has a detailed web page in Japanese describing exhibits at Atata Exchange Center. In addition, the association's web site has a fascinating 13-part section featuring extended interviews with three former kaiten pilots at Hirao.